We had a full charter and I wanted to give them the best conditions I could find. We had driven around the cape earlier and found that going south would give us the most clear, flat, calm options. As we powered out of Gloucester Harbor, we saw a large navy ship at anchor for Fiesta weekend. It was pointing into the slight northwesterly wind. So I turned left at the Dog Bar Breakwater. The further we went, the calmer the water looked. Finally, we dropped anchor at the base of the bluff in Loblolly Cove in Rockport, MA Everyone splashed in quickly except Sylvia who was bubble-watching. Jacki K. and Andy were exploring. Paul Savageau was trying out his new camera and strobes before leaving for the Galapagos next Saturday. Patrick Scalli and Richard Brandolini were hunting, as were Pete and Pat. The Captain and I were videoing anything that couldn’t get away. Kathy Cardinale was crewing. We saw a school of pollack up in the shallows. 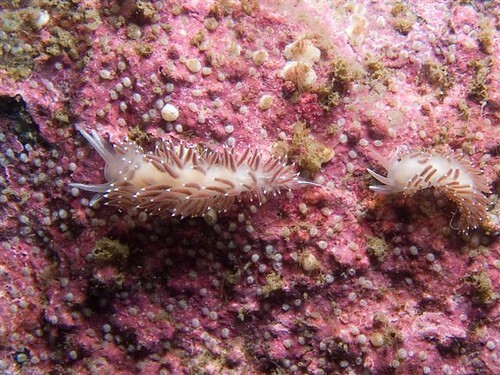 I found a decorator crap with lots of white tunicate bunches on his back and legs for camoflage. The water was between 52 and 55 at 30 feet with about 15-20 feet of visibility. Not bad. 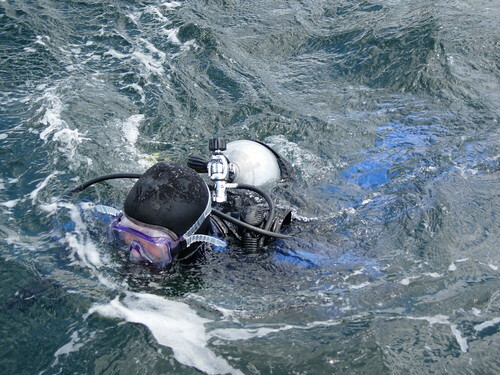 For the second dive, I wanted to try somewhere on nearby Thacher Island. After driving all the way around the island, we found the calmest place was under the dead light. The anchor landed in about 25 feet and Pete could see it lying on the kelp. Everyone went in for a second time and came back raving about the conditions. It was warmer at about 55, with a thermocline at about 35 feet. Visibility was better at about 20 feet. I think the incoming tide had something to do with that. While we were under, Kathy and Sylvia saw a seal’s head out at the point. He/she never came any closer. Pete and Patrick helped a lobsterman who had backed over a pot and gotten it tangled in his prop. They swam over to him when he asked for assistance and held their breath to saw the rope free. Two dives did it and they swam back to us. The lobster boat was crewed by a man with a small boy along for company. They waved to us as they left. The Captain videoed the whole affair. Wonderful clouds, warm breeze, calm seas for our trip back to the marina. It doesn’t get much better than this. We ended with a cookout at Jacki’s new condo’s barbeque area and had a feast. We had less wind this morning, and a weatherperson’s promise of clear skies. It looked like we could have our pick of great dive sites. I chose Stone Garage – one of my favorites. The tide was going out, so I picked a spot that would let us swing clear of any rocks. It was about 25 feet deep. The visibility turned out to be not very good, maybe 10-15 feet. There were lots of particles in the water. It was about 50 degrees. Jacki K. and Paul Savageau were buddies for a videoing exercise. The Captain and I were similarly engaged. Pete and Pat were hunting. 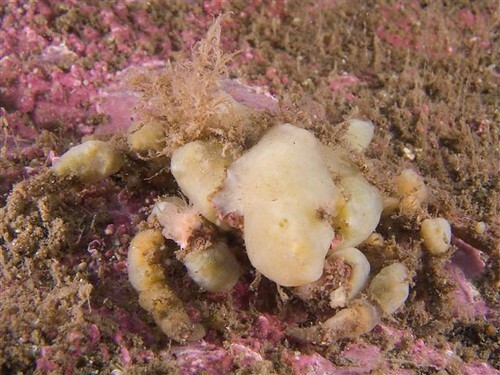 I saw a decorator crab with mostly white growth on his back unsuccessfully hiding among grey/brown kelp fronds. There were flounder and a school of pollack, according to Pete. Pat caught 4 lobsters; Pete did almost as well. 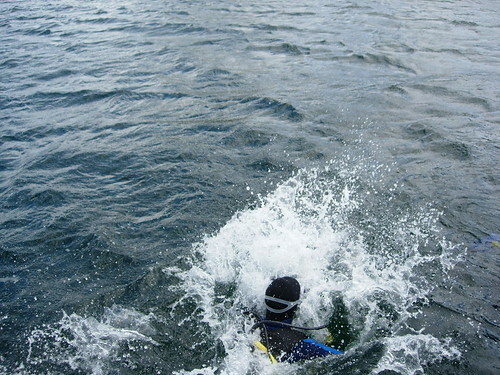 The second dive was at the far edge on Salt Island. This spot is protected from northwesterly breezes. I love it because it has lots of striped bass up in the shallows. Again, we videoed anything that looked interesting. I “caught” the first golf ball of the season. I also saw Ctenophores or comb jellies and a red decorator crab, successfully hiding in red sea weed. He was too shallow to capture on video because I couldn’t keep rock steady. Pat snoozed on the bow, having brought cold cuts for our lunch. We snarfed them down. Nevertheless, The Captain downed a 1/2 can of cold chili to beat back the hungries that were left. So much for Weight Watchers. The sea breeze kicked in at about 1:30 as the tide changed. It was time to go. A lovely day with nice people. Thanks to Bill Low, we have pictures of Catie’s success yesterday. It was bright, clear and blustery today. The first two were OK, but the third meant we had to find a sheltered anchorage for a 20-30 knot WNW wind. 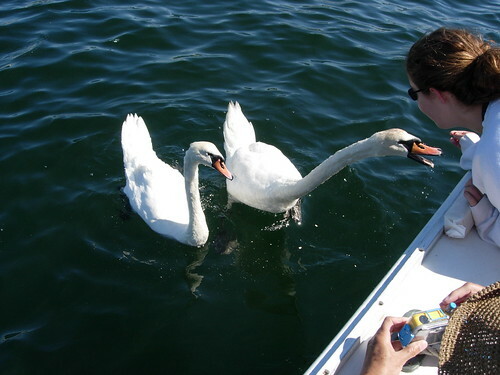 We started by getting fuel at Brown’s Yacht Yard and feeding two local swans saltine crackers. 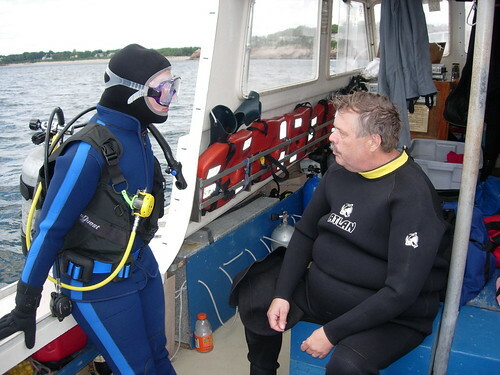 Tom and Catie Childress of Amherst, MA, joined us for her first post-certification dives today. 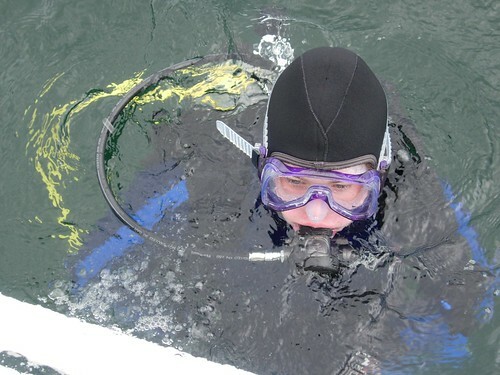 A proud dad, Tom hasn’t been with us for eight years, but wanted his 14 year old daughter, Catie, to get some experience by diving from a boat and being with the Easy Diver crew. Catie learned to dive with Holyoke Underwater. They did a great job – her weight was spot on and her skills were just fine. She is a natural and spent part of the first dive holding a live flounder in her gloved hands. 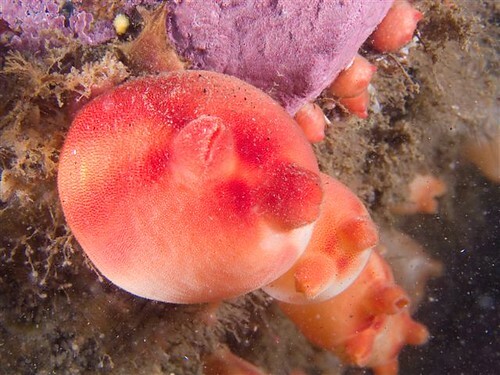 She also got to see a moon snail chowing down on a clam and collected treasure at the Wreck of the New Hampshire. All this was courtesy of her dive buddy, Peter. Bill Low joined us even though he couldn’t dive today. He was a great help to everyone because he knows the drill and is quick to react. He lugged gear and tanks and was much appreciated by tired divers. New NAUI Instructor, Mike Lane, caught two lobsters, but had to let the great, big one (“the biggest one I ever caught”) go because she had eggs. The Captain and I worked to get some video footage even though the visibility was poor at about 10 feet. The water was warmer than it has been. It was about 55 degrees at 27 feet. I saw a teeny, tiny red lump fish (I think). The video shows its irridescent blue eye stripe and how closely it matches the surrounding red sea week. 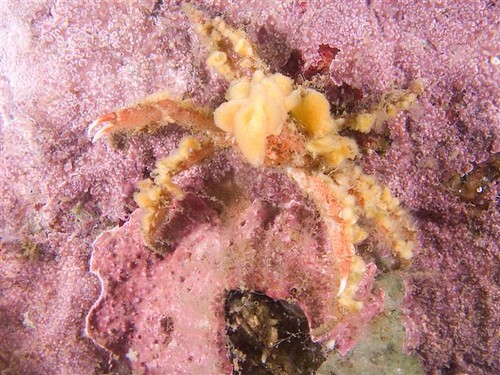 I also saw a bedecked decorator crab on an abandoned lobster trap. He was festooned with pieces of red kelp all the way out to his nose from the back of his shell. The video doesn’t do him justice. We made both dives at the wreck site, so Catie could feel comfortable with the depth and the swim platform entry and exit. She even helped pull the anchor. What a trooper! If pictures of our adventures surface from anyone, I’ll post them for your enjoyment. 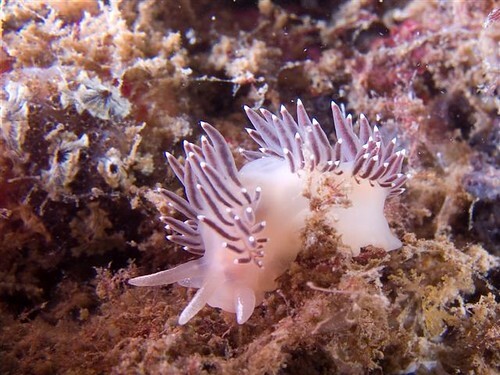 David Wood’s photos of this nudibranch were taken on Sunday, June 17th at The Restaurant at Folly Cove. They are beautiful. And thank you, David, for sharing these. David Wood of Dennis has a wonderful eye, don’t you think? These sea peaches look ready to burst. What a great color combination with the pink coraline algae. Most rock gunnel shots I’ve gotten lately are of their back sides. David got this one looking right at him. 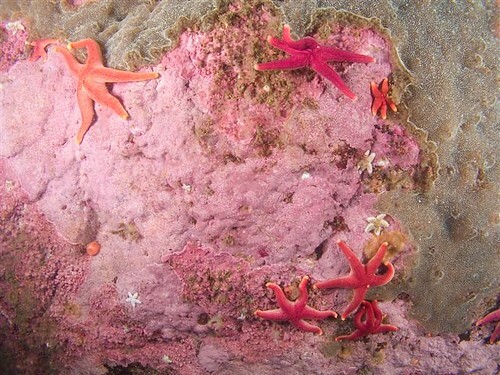 These sea stars look to be eating the colonial tunicate. Good! It’s a non-native species that’s invading. 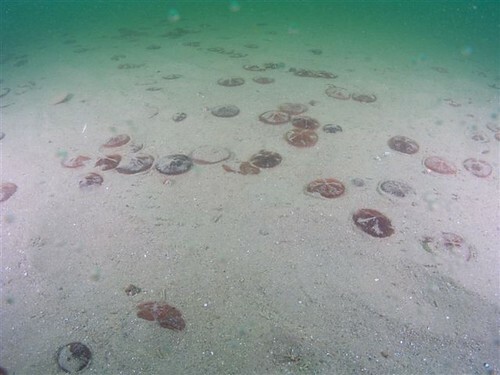 If only sand dollars were worth their name, we’d be rich. 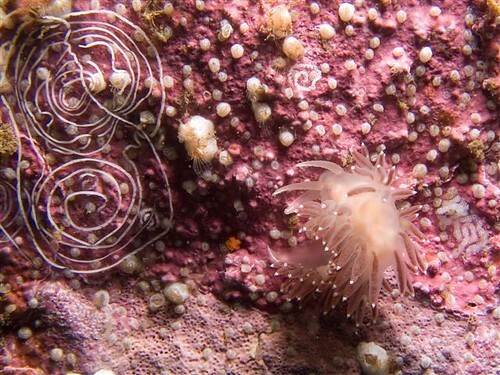 David Wood of Dennis was kind enough to share some of the beautiful photos he took while diving off Easy Diver last Sunday in Folly Cove and at the wall at The Restaurant at Folly Cove. Today was too good to be true. Warm sun, no wind (not even a breeze), and great customers. We went north to get the best possible conditions for four picture takers and videographers. David W. from Dennis was doing still shots. Paul Savageau was using video, as were The Captain and I. Joe Finkhouse was sight-seeing as was Jacki K. Peter and Pat were the remaining crew. Visibility was still pretty bad – 10 feet. Water at 25 feet was about 50 degrees at Calf Cove. Peter saw an ocean pout and I saw stripers. The passing parade of other folk stirred up the bottom enough to make conditions best at the wall itself. Half way up it I saw a rock gunnel in a notch and some kind of basket star waving its tentacles from the husk of a barnicle. We made the second dive at the Lobster Pool Restaurant. I anchored in 35 feet of water. It was a little clearer deeper. Joe Finkhouse said it was 58 degrees on the surface close into the restaurant’s shore. He was followed throughout his dive by a very friendly or just curious striped bass. It kept coming back to him whenever they got separated. The perfect dive buddy. 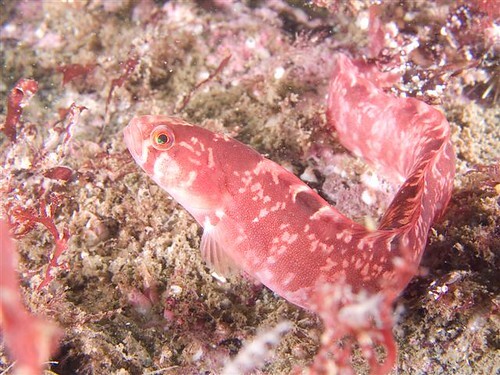 Paul videoed a rock steady scarlet psolus and two sculpin very close up. I got some good shots of decorator crabs on an old lobster trap. Pat rowed ashore to get The Captain a Father’s Day hotdog. She brought back french fries and onion rings for everyone as well as hotdogs for herself and me. The Captain wolfed his down without hardly taking a breath. Everything tastes like ambrosia when you’ve been diving. The trip back down the river was uneventful and hot. No breeze can be a bad thing sometimes. We pulled into the marina just a some big thunderheads kicked up a ruckous with thunder and spotty rain. It was quickly over, but cooled our heads as we trucked up the ramp with drippy gear. It is certainly summer around here now. It couldn’t have been “beautifuller” – above water. We powered north and found a good anchorage at The Restaurant at Folly Cove. I put the anchor in 35 feet, but the boat swung as a sea breeze started from the south west. We were soon hovering over 50 feet, according to the depth sounder. Veronica and Jacki K. fought the incoming tidal current to get up to the anchorline for their descent in order to stay shallow. Bernie, Jerry and Juli were up from Connecticut and sight-seeing. Al and Larry were hunting for dinner. Kathy C. was crew along with The Captain and me. Jacki said the water was 50 degrees at 45 feet. But, also reported that visibility was only 5 feet underwater. 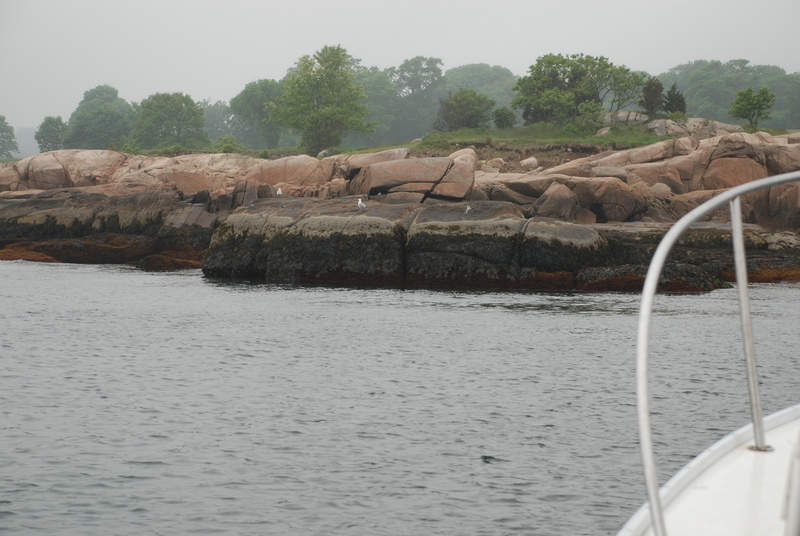 We tried going around Halibut Point for better visibility, but large rollers were pounding that side of the cape. We turned around and motored for Calf Cove. I anchored under the gazebo on shore and everyone went in close to the wall. The conditions were great up top. Not so good down there.